Commodity Trading News And Technical Analysis Reports. 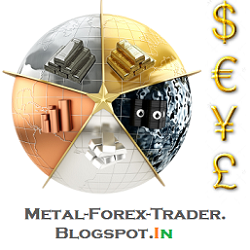 : New Rules For Investing In Gold India. New Rules For Investing In Gold India. The Centre’s curbs on gold mean fewer investment options and lower liquidity. So, how does an investor get around this? The price of 24-carat gold in the international market is $1320/ounce. In rupee terms this works out to Rs 25,727/10 gm. But did you know that you cannot buy gold today at anything less than Rs 30,000 per 10 gm? Gold in India is now at a 15 per cent premium to international prices. Just last year, you coughed up only a 2-3 per cent premium.One reason for this is the import duty hikes, which have pegged up duty on gold imports from 4 per cent in December last year to 10 per cent now. But the many restrictions on gold imports have also resulted in a severe short supply of gold in domestic markets, leading to a further ‘mark-up’ by suppliers. Since June, gold prices have rallied 20 per cent in India (helped partly by rupee depreciation). Gold has risen only 6 per cent in the international market. The widening premium on Indian gold has not deterred shoppers at Zaveri Bazaar or T.Nagar, but it sure has hit investors. Units of gold-backed exchange traded funds are trading at a 5-6 per cent premium to their true worth — their net asset value (NAV) in the secondary market. Government moves barring sale of gold coins/bars by banks and tighter gold lending norms have also hit investors by way of fewer options and lower liquidity on gold investments. Here are four ways in which gold markets have changed in the last one year — and how you could go about dealing with the change. India imported 142.5 tonnes and 162 tonnes of gold in April and May, respectively, but later, as the government cracked down on gold imports by hiking import duty and imposing export obligations, the imports dwindled. In August it is estimated that less than five tonnes of gold came into the country. 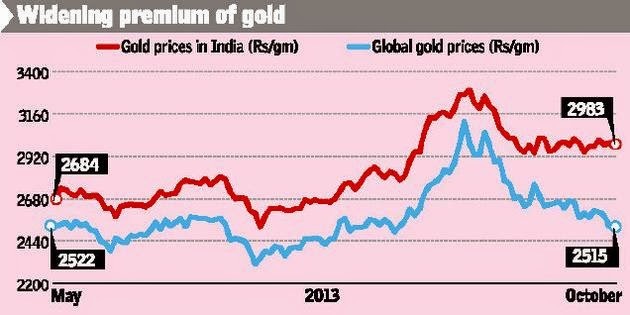 But as jewellery demand hasn’t moderated as much, this has set off a rally in domestic gold prices. From an average $5-6/ to an ounce, Indian buyers now shell out a premium of $40-45 an ounce on every bar of gold they buy. The premium in the physical markets has set off price increases in the ETF market too. Gold ETFs in the country, which traditionally traded at par or at a discount to their NAVs, have recently moved to a premium. Goldman Sachs gold exchange traded scheme (gold BeES) — the largest gold backed exchange traded fund — is at a 5 per cent premium to its NAV now. Anyone who wants units of this fund will have to pay Rs 2,872 for each unit, though units will be credited at the NAV of Rs 2,737.5 only. The premium on ETF gold units could also be because the curbs on imports have halted creation of new gold units by ETFs. With only a limited supply of ETF units available to investors, the premium on these units has widened. If buying domestic gold has become a more expensive proposition, investing in gold has become more difficult too, with shrinking options for those who fancy the yellow metal. Retail investors who used to buy coins or bars of certified purity from the banks or post offices can no longer do so. In May, the Reserve Bank of India banned banks from selling gold bars/coins. Following this India Post also discontinued sale of gold coins. As an offshoot of this, gold savings funds, once a popular option with investors, have stopped sales too. Reliance Gold Savings Fund — a fund investing in gold ETFs has — completely stopped sale of new units. Even jewellers no longer prefer to retail gold in coin or bar form. Jewellers claim to have ‘voluntarily’ discontinued coin sales to help the government rein in the current account deficit (CAD). Of course, it also suits them to market more jewellery where margins are higher. With all this, buying gold ETFs directly from the exchanges is the only remaining avenue to invest in gold. Buying jewellery is an option that remains. But remember that it comes with hefty costs — making charges and wastage are likely to add on to the premium that you are already paying over global gold prices. While quite a few investment options on gold have closed out, liquidating your existing holdings has become more difficult. Banks now are barred from lending against gold coins weighing more than 50 gs as well as gold ETF units and gold mutual funds. Already banks were not buying back the gold coins they sell; now they have stopped lending against them too. Gone also are the days of five-minute gold loans from non-banking finance companies (NBFCs). RBI regulations in September have prohibited these companies from extending gold loans without proof of ownership for any loans involving more than 20 gs of gold. There are also new caps on the value of jewels you will have to pledge as security and the prices at which these are valued. The new loan-to-value norms expressly bar NBFCs from lending more than 60 per cent of the market value of gold pledged with them. The pricing of this gold should also be at the average price of gold in the last one month. The new restrictions on gold imports have, however, opened up a couple of new options for those seeking to trade in their old gold. For one, the shortage of raw materials has pushed gold jewellers to come up with more schemes that incentivise people to trade in their old gold jewellery. Exchanging jewellery for cash is a practice long discontinued by the industry but today such deals are being revived. Jewellers have started to offer higher rates (roughly Rs 50-100 per gm) on the old gold being exchanged. However, this may not be entirely a bonus. Consumers need to check the ‘wastage’ percentage applied on the old jewellery, because jewellers normally inflate wastage charges when offering a higher per gm rate on old jewellery. You can also monetise your old gold coins/jewellery by depositing your holdings with the gold deposit schemes of banks. The minimum maturity period for these deposits has been reduced from three years to six months by the Reserve Bank of India. The deposit scheme now offered by SBI allows you to deposit physical gold in jewellery or coin form for a nominal interest payment with the bank. When you make a deposit, the bank melts the jewellery, tests the purity of gold and then issues a deposit certificate which you hold till maturity. Interest on this deposit is around 1 per cent per annum and will be calculated on the value of gold deposited by weight. At the end of the maturity period, your gold will be returned in bar form. The advantage with deposits is that you get income on your idle gold holdings. You are also saved the trouble of finding and paying steep rentals (Rs 1,000-45,000) depending on the size of the locker) to a bank for safekeeping of this gold. The deposited gold is also exempt from wealth tax. But the flip side is that this scheme may only help really large holders of gold, as the minimum deposit requirement is 500 gm. Weekly Economic Data For 19-Oct-13 to 25-Oct-13. Nickel approaching critical long-term support. Japanese Candlestick Basics. Simple Pattern. Gold-Silver ratio signals a bearish outlook.